1 tsp Nutritional Yeast NOT brewer's yeast! This will take about 30 minutes to make. Do it in the morning! Start boiling 4 cups of water in a large pot on the stove, on high heat. Pour the olive oil into a bottle. Optionally, pour a little vinegar in the bottle too. Pour the molasses into the bottle. Seal and shake the bottle. Once the water starts boiling, add the frozen broccoli. Once the water starts boiling again, add the frozen spinach. Once the water starts boiling again, add the rolled oats and stir them in. Once the water starts boiling again, reduce heat to medium. Cook for 10-15 minutes, stirring at least every couple minutes. Crack the eggs into the porridge and reduce heat to low. Cook for 1-5 more minutes, stirring continuously. Add in any spices or flavorings you want. Dish up ⅓ of the porridge into a bowl. Place 4 pieces of pickled herring on the bowl of porridge. Add any other toppings you want. Pickles and sauerkraut are good. Rinse and dry the raw spinach. Or not. Tear the spinach into smaller pieces. Or not. 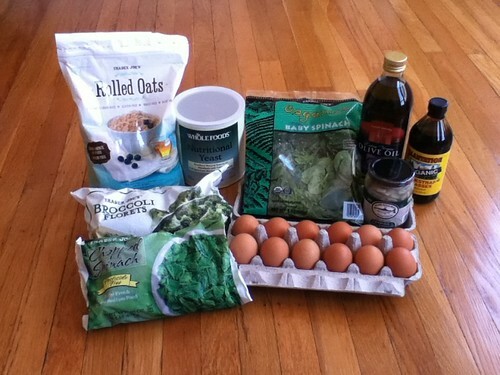 Place ⅓ of the spinach into another bowl. Add in any other salad toppings you want. Berries are good. Drizzle ⅓ of the dressing over the bowl of spinach. 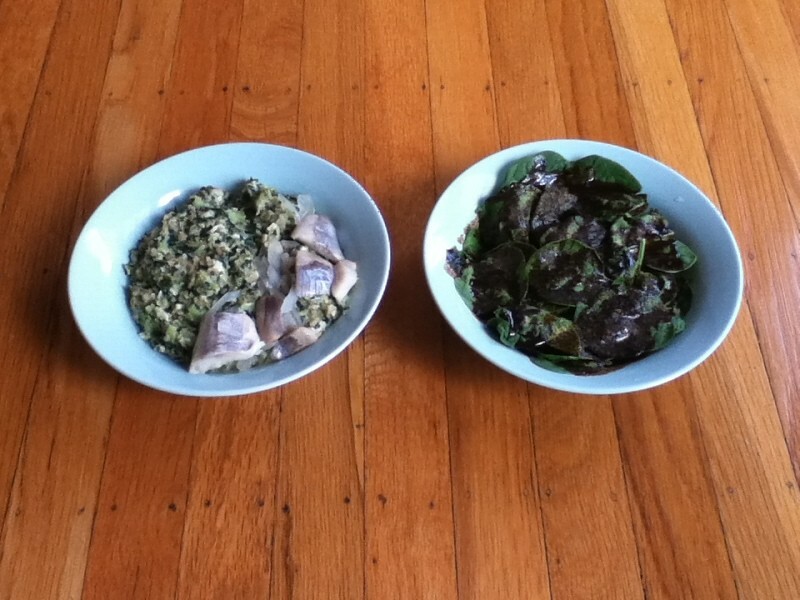 Sprinkle ⅓ of the nutritional yeast over the bowl of spinach. Sprinkle on any other spices you want. Cinnamon and cayenne pepper are good. 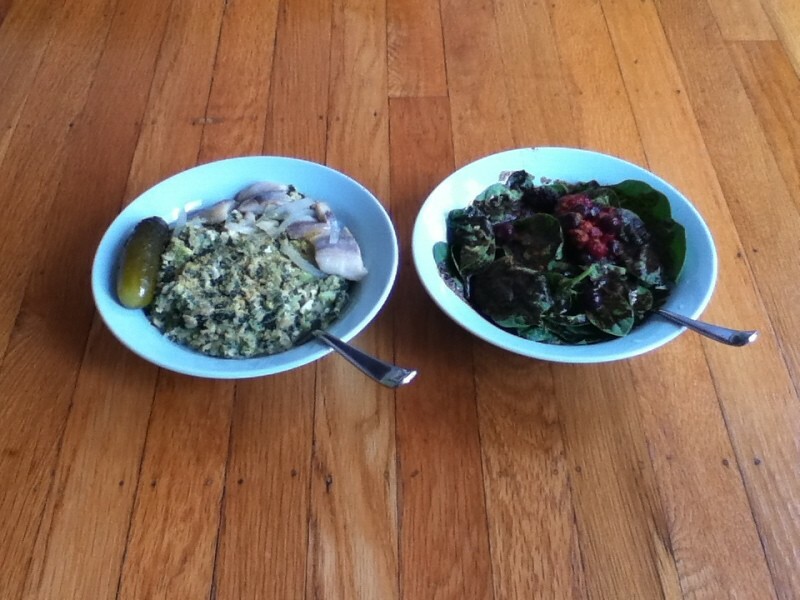 Eat the porridge and salad together. If you have a huge bowl, you can even mix them up together! If you are looking for something cheaper and more convenient, check out my other recipes on this site for a ton of nutritionally complete drink mixes. Or if you just want to buy my recipes ready-made, check out my website Custom Body Fuel, where you can buy popular mixes like Schmoylent and have them shipped to you directly, or request a custom blend. * Percent Daily Values are based on "axcho's U.S. government DRI, male 19-50, 2000 calories, 33/17/50". You may use the Nutrient Calculator to personalise your own profile, then select it from the list on the Recipe Editor tab.